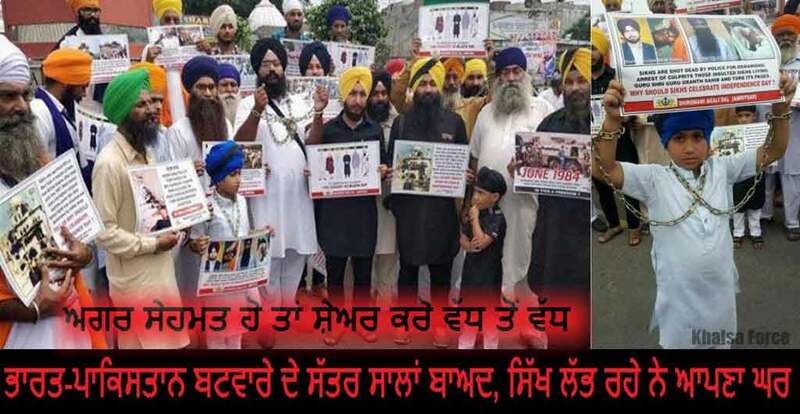 AMRITSAR SAHIB—Activists of pro-freedom Sikh outfit Shiromani Akali Dal (Amritsar) today staged a protest at Hall Gate of Amritsar City to mark the Indian Independence Day as Black Day for Sikhs. The Sikh activists registered their protest by shackling themselves in chains and tying Black ribbons on their turbans. Interacting with media, SAD (Amritsar) leader S. Navdeep Singh Amritsar said that the Indian leadership had betrayed the Sikh community by denying it an independent area to live in Northern India. He added that in the last 70 years of India’s so called freedom, the Punjab state and Sikh community was subjected to severe injustices by the Indian state. “The Indian state demolished our supreme throne Sri Akal Takht Sahib, massacred our youth in the late 1980’s and early 1990’s besides looting our natural resources. So how could we observe 15 August as an Independence Day?” he added. Three generations of Sikhs were noticed taking part in this protest by standing around the Shaheed Udham Singh Memorial round-about outside the Hall Gate, Amritsar. SADA’s General Secretary S. Amrik Singh Ballowal, Dr. Gurjinder Singh, S. Gursharan Singh Sohal, S. Pritpal Singh, S. Gurmail Singh Shergill, S. Amarjit Singh, Harry Sandhu etc. were prominent among the protest staging activists. Unconscious but unwavering , being taken to DMC Hospital, Ludhiana after Bapu Ji’s condition worsened few hours back.